-Back in stock! Mandatory original recording of this cult album, Nebelfee Klangwerke version. -Back in stock, digipack version on Nebelfee Klangwerke. -Remixed, revised, remastered: The Return of Asgardsrei! -A bizarre conjuration of raw cavernous progressive atmospheric Death Metal that envelopes a miasma-like fury that summons the inevitable chaos and destruction, Invictus Productions version. -As the title is saying it includes the first 3 demos, essential for Arghoslent maniacs! -Arghoslent with killer riffs and melodic as always and Martial Barrage brutal and aggressive. -Extremely raw and lo-fi Australian Black Metal. -Back in stock! Raw Russian Black Metal cult. -Over 42 minutes of Finnish Black Metal released under the wings of Cocainacopia. -Two artistic entities offer up an unconventional course of community incorporating wailing post-punk with dream ambience. -The following of the split cassette featuring exclusive material from both atcs. -Up from the ashes arose Dark Sonority, and their first offerings here presented are the tracks made under the Kaosritual banner, only performed a few times live but never before recorded. -Debut EP from Desolate Winds featuring two tracks of plodding, atmospheric black metal from the Cumbrian region of the UK. -Great Black Metal release under the banner of Drakkar Productions. -Features interviews with Akitsa, Drowning the Light, Veld, Irae, Heil, Satanize, Rainha Colera and an extensive review section. -Depressive Black Metal from the Netherlands. -Although the Band has added a few new elements to their music, Eternity are still sticking to with what they began 18 years ago, celebrating nothing else than Black Metal. -Six tracks of pure heretic Black Metal filled total hate and aggression. -Debut demo from Swiss atmospheric black metal act, Tardigrada. Over 30 minutes of truly excellent music crafted with far more care than the average demo tape. -Mystical pagan Black Metal, raw with low production. -Uncompromising and intense devoted Black Metal. -Brazilian Black Metal on Eternal Fog Records. -Improvised raw Finnish Punk influenced Black Metal. -Underground Black Metal split release on Eternal Fog Records. -Debut works from two cold, depressive, sorrowful Black Metal act's from Brazil. -114 pages format A5 avec des interviews en français de Bael, Afflictis Lentae, Orthanc, Infernal War, The Arrival of Satan, Wolok et plus. -Compilation of unreleased songs of this great underground German Black Metal horde. -Six songs of nightmarish Black Metal with the precise, sharpened and embracing force of utter darkness. -Only a few in stock, act fast! -Back in stock! After two demos and one split tape, here comes the debut album of this great Black Metal band for Portugal, highly recommended! -Back in stock! 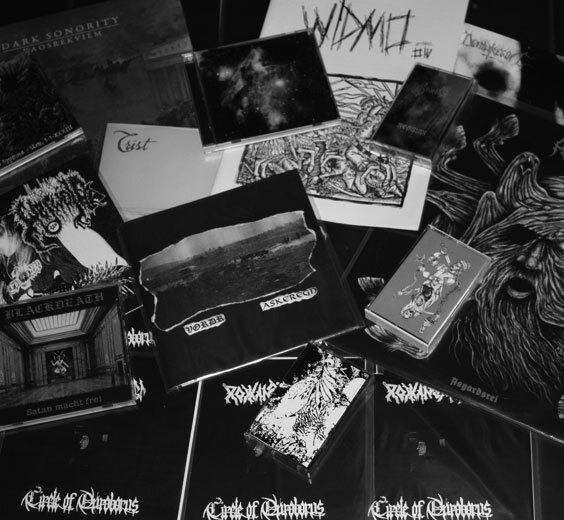 Two of the best German underground Black Metal projects gathered, highly recommended! -Recorded in Spring 2009, "Nostalgie" makes use of the classic Trist style, but evokes a different emotion than many of his other works. -Raw Black Metal on Cocainacopia. -Ambient horror soundtrack music, bewitching! -Epic but raw Black Metal featuring members of Unholy Crucifix. -Pure underground Black Metal from Finland and Norway, highly recommended! -Russian atmospheric Pagan Black Metal on Stellar Winter Records. -Underground Polish magazine featuring interviews with Stabat Mater, Arkona, Dark Fury, Darkthrone, Flame of War and more.